We are living in the age when we can see mass media turning into media of masses. Printing press, back in fifteenth century, started a publishing boom and an information revolution. Along the way, market forces established the rights and rules of the game for the privileged few who could afford to buy printing presses and grind forests into paper. Result: handful few own the industry and control information - they decide what the masses will learn. These few disseminate information on a need-to-know basis mostly. You know them. That's the world of mass media. Blogs are turning the world of mass media into media of masses and divide between the publishers and the public is already collapsing. In this attention age, any yakkers, hacker, geek or an anti establishment political devotee or a dolt with a connected computer can open a free account at Wordpress, Blogger, Squidoo or other blog services (there are so many out there), and start a blog. It is really as simple as that. 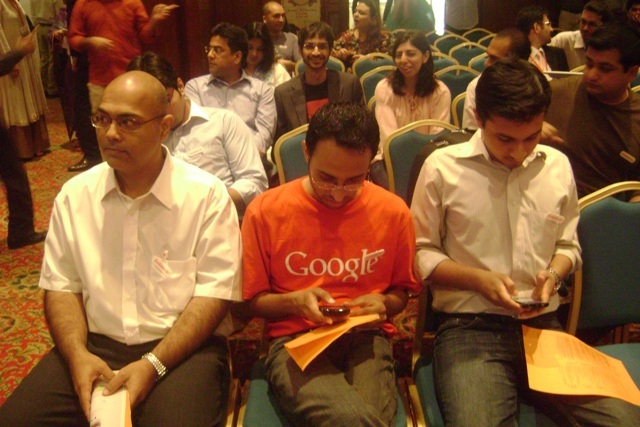 Blogging is no more a new trend in Pakistan. Many Pakistani online users are writing their own blogs and rest are reading others' blogs and interacting in meaningful ways. Their voice is being heard in the online world. This very forum, Network! 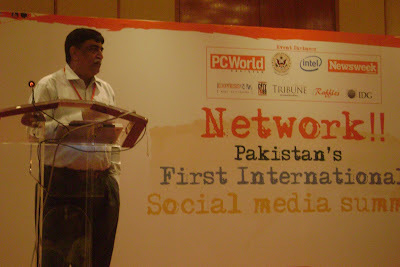 - Pakistan's First International Social Media Summit, is testimony to that. I am sure this event will go a long way in promoting blogging and use of social media to bring positive changes at gross roots levels in local context. Many thanks to the organizers (US Consulate, CIO (Rabia Gharib), Intel, PC World, Express Tribune, ARY, Newsweek Pakistan and more), for making it possible to connect and network. Also, I take this opportunity to suggest that such meet ups should be more frequent and in Lahore too. Monetizing, getting paid for blogging and making money is still a new idea in Pakistan. There are reasons for this. Sadly, corporate Pakistan is yet not aware of blogs as communication channel and an economical, effective and interactive marketing tool. Most bloggers still are shy to making money through their bloggy efforts and there are some other inherent disadvantages. Let us have a look at these factors. Let me say on the outset that businesses cannot afford to ignore blogs because blogs are simply the most explosive outbreak in the information era since the Internet itself. In more connected and more developed world blogs are already shaking up just about every business. It does not matter whether you are making Cholistani handicrafts in Rajanpur or FIFA footballs in Sambriyal, blogs are a phenomenon that no futuristic business can postpone any further (they should not). Given the changes barreling down upon us (you call it globalization), blogs are not a business elective. They are a prerequisite. Like anywhere else, blogs can be a welcome mat for local businesses to reach out across the world but this has not started happening yet. And if it is happening, it is on a very small scale. I know (you also know) most of the bloggers are hesitant to talk about making money from blogs what to talk of making some. They do not even want to hear about those alpha bloggers making millions. It is time that we should talk about it and talk frankly. Every blog with a decent amount of readers have an economic potential. But not every bloggers is trying to tape this potential. There are three categories of local bloggers; first, those who are still shy to make money from their blogs or announce their desire to monetize. Those who seethe with envy but still don’t go ahead to monetize. And another category is of bloggers who are trying to chase their own fortune on the Web; with varying degrees of success. Walk around the Pakistani blogosphere and you will see enterprising bloggers showing Google-generated ads, or ads by other pay per click programs like AdBrite or Chitika, and earning some pocket change from their blogs. There is so much more that can be done. Blog entrepreneurs can sell ads space on their pages. Popular blogs can also land sponsorship deals for good amounts. I know of a few examples of bloggers flipping blogs in Pakistan. I myself sold one of my project blog titled Fine Art of Blogging only recently. By the way, the man who bought from me is bringing out a book out of that blog; same name. Soon you will find book titled Fine Art of Blogging in the market. I have tried with merchandising through my blogs. Attempt to sell my own books (and the one I have translated) was an experience. While I did not have a lot of success with merchandising (my books are in Urdu and I blame lack of Urdu culture online), I am sure other able bloggers can see this as an opportunity to make some money from blogs by selling products. That is not all. Bloggers can sell any product whatever way their entrepreneurial heart desires using CafePress type platform or by creating or adding online store's link to blogs. Bloggers can experiment with different sale programs that suit them and can create diverse streams of earnings. The choice is endless. If nothing else, selling Amazon books and other stuff is as popular with bloggers as Google AdSense. You simply put the Affiliate link and get the commission when someone buys from Amazon going from your site. Anyone who blogs can make decent money. The essence of this sweeping statement is that that you should be able to connect the disconnected to each other. Connect advertisers to people who want to be advertised. Connect job hunters with jobs. Connect information seekers with information. Connect teams to each other. Connect those seeking similar. Connect to partners and those that can leverage your work. Connect people who are proximate geographically. Connect like-minded people into a movement. Connect people buying with people who are selling. It is this connection for which businesses and individuals from all over the world offer to pay bloggers for mentioning them, their products and or services in blogs. Bloggers create an online buzz and businesses get connected with their desired and focused segments. Many online platforms like PayPerPost, Social Spark, InPostLinks, Sponzia, Sponsored Review, Loud Launch, Reviewsme Linkworth, to name just a few, have come up. These services manage growing demands by advertisers and arrange supply through interested bloggers. Few years ago, I had signed up for some of the services that pay through check. They offer products and services for writing reviews. I write about whatever I like and they pay me fifty percent of what they charge the advertisers. Most of my blogging money comes from products reviews. That is why you see review of the best plumbing service in New York on my personal blog right next to the post about my favorite folk singer Pathane Khan. Overall, blog power simply has not translated into big bucks here in the local market. Exceptions notwithstanding, for now, Pakistan blogosphere is running mostly on people's passion to communicate and no money. 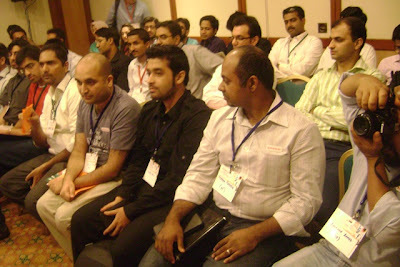 It is in this milieu that I call corporate Pakistan to come forward, understand blogging phenomenon and take advantages. This is the call of this presentation. A strong online presence is important for businesses in today's high-speed and competitive world. Blogs have already become a new buzz marketing online. The big question is who should blog for the businesses? Ideally, front line people who know the business in and out should blog about it. Marketing professionals can also use this powerful tool. Organization can hire professional writers to blog for them under company's name or blog under their own. Depending upon the feedback and information provided by audience, an inside blogger can develop the ability to write in his or her own voice and create content for business blog. When the businesses do not have right bloggers within their own ranks or don’t have time to pursue this rather erudite effort, they may hire external bloggers. External bloggers (call them blog consultants, social media strategists or whatever) can view business with an objective eye and offer fresh marketing ideas and strategies. External blogger can study company's marketing materials, reports, other collateral information, and meet key people in organization to learn about what organization does and how best to market the product through blogging and can post material written in editorial style and voice. The content may also include company news, events, and information about new products and services relevant to your business and a whole lot more. I myself am running one German and another Cameroonian blogs as an external blogger. One wonder why local businesses have failed to notice the growing readership and influence of these Internet postings and the buzz corporate blogging can create particularly as a process of Search Engine Marketing or targeting online segment of consumers. In this case again, the responsibility to educate corporate Pakistan again lies with bloggers. Please let them know what you can do for them and how. Let me add here, Pakistan bloggers are exceptionally good (and I am not being ethnocentric here). They have expertise for corporate writing. Their language and blogging skills and networking capabilities can be compared with any bloggers' community in the world. Internet coverage and users ' base is constantly growing. Even trend to shop online is taking off. Given chance, all this can indirectly help in efforts to make making through blogging. Fine art of blogging is a creative activity and fun. Most bloggers enjoy blogging. That is why they are blogging in the first place. I suggest everyone who can must either buy a printing press or have a blog. And those who have a blog must think about getting paid for blogging. Good coverage of the conference and good speech delivered. I wish you luck in your monetizing efforts. Shirazi, when our paths crossed several years ago, you were on the cutting edge of social media. You still are. 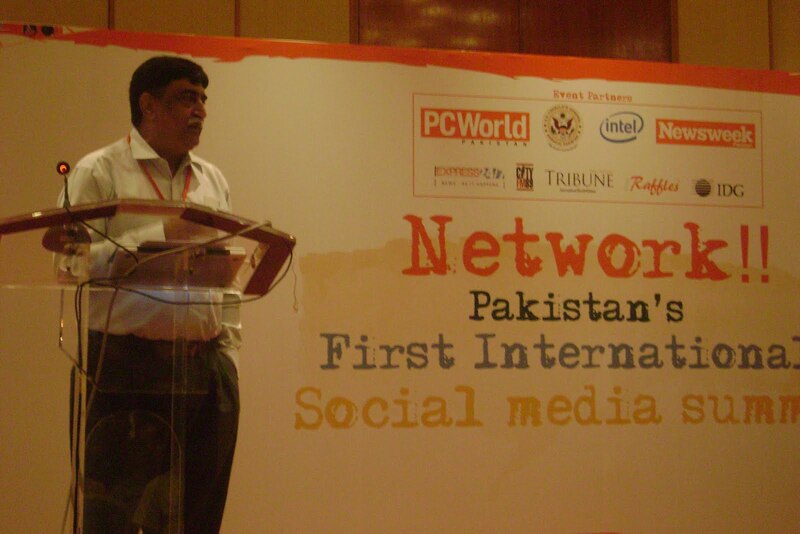 It is only rightfully so that you speak at Pakistan's First International Social Media Summit. Congrats on the conference. I'm sure it was a wonderful event. Wishing you continued success as a social media guru. A valuable post. The social media summit is the biggening of right move. Some one like Shirazi sb had to took initiative. All types of media can play important role in our social activities and developments.Congradulations to Shirazi sb on this stepping forward. I recently came across your blog and have been reading along. I thought I would leave my first comment. I dont know what to say except that I have enjoyed reading. Nice blog.